The SECO-LARM EAP-5D1Q and EAP-5D5Q power supplies are specifically designed for an access control system's electronic locks and accessories. These power supplies centralize the power sources of access control equipment. 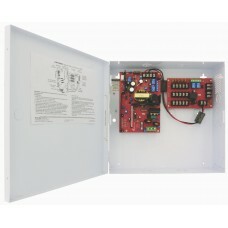 They include two supervision relays that can be used to integrate with other systems such as an alarm control panel. Robust fault response and indication also includes gradual shutdown on output overload as well as immediate shutdown on output short, signalled by flashing red LED and with auto-recovery once output short or overload is removed.